The decorative application of gold or gold coloring to a portion of a book on the spine, edges of the text block, or an inlay in the front cover of the boards, for example. It is added by applying gold powder or a thin sheet of gold (Gold Leaf) to a cover, board or pages. Gilting is not only for decorative reasons it also serves a purpose. 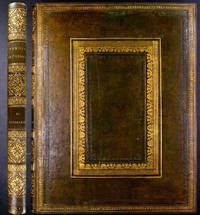 When applied with glue, gilt helps to protect the page edges from moisture, browning, and dust. Gold paint can also be applied but may scuff or chip.